Charles Bage (1751-1822) designed the first ever iron framed building, the Ditherington Flax Mill, located in the outskirts of Shrewsbury town centre, built in 1796 and 1797. Here Bage used his ‘fireproof’ design, which relied on cast iron and brick with flag stone floors. Such construction greatly strengthened the structure of mills, which enabled them to accommodate much bigger machines. Innovative use of new building materials such as iron, steel, concrete and glass drove the invention of new building techniques as part of the Industrial Revolution, and was a key precursor of Modern Architecture. Bage might also be credited with the invention of the ‘quadruple’ or ‘cluster’ house, and the first of these houses were built for overseers at the Flax Mill in Shrewsbury. 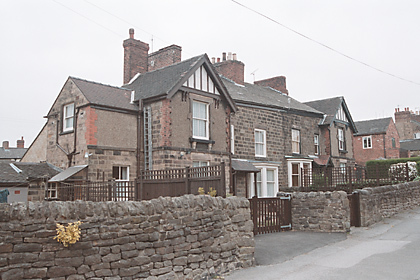 Though these no longer survive, we still have examples in Belper, Amber Valley in Derbyshire, England which were built about 1803 by William Strutt in co-operation with Bage. In this plan, one block divided north-south and east-west to form 4 back to back houses. Each block sited in the center of a large plot so that the northern 2 houses in each block are on one street and those to the south on another. Eight blocks were originally envisaged but only 5 actually built. They were intended as houses for mill foremen and managerial staff. 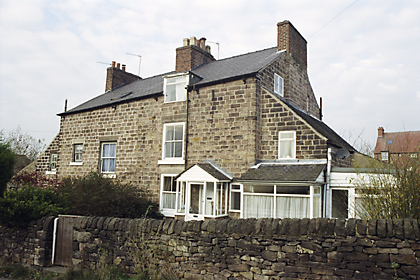 These houses in Derbyshire are believed the oldest surviving example of this particular housing type, and were listed in 1979.